Enerpac offer hydraulic pumps that offer safety, speed and control. A new generation air-over-hydraulic foot pump is being introduced by Enerpac to enable finer and safer control of tasks while completing jobs up to twice as quickly as conventional pumps. XVARI technology has set a new industrial standard that eclipses the 50-year-old technology of conventional air-over-hydraulic foot pumps. XVARI technology allows users to continuously and precisely control the amount of hydraulic oil flow in the pump’s advance and retract mode, giving fine control of the speed of operation of the single-acting hydraulic cylinder or tool that the pump is powering. This fine process control is especially valuable for jobs that require accurate load positioning, aligning and controlled descent. The better control improves productivity, enhances process quality and makes the workplace safer. Enerpac have also applied a two pedal design in its hydraulic pumps: one for tool advance (introducing pressure) and one for tool retract (releasing pressure). The pedals are depressed with the ball of the foot so the heel stays on the ground, with bodyweight resting on both legs during operation. This causes less fatigue and provides increased stability and better control over the degree of pressure and control on the pump. The pump can be optionally equipped with an integrated pressure gauge. The 8kg pump’s broad base area enhances its stability. XVARI technology produced gains of up to 50 percent compared with conventional air-over-hydraulic pumps. XVARI’s rotating air motor and rotating two-stage pump element also offers accurate control of speed through the pedal control. This fine control provides a variable oil flow, so the speed and position of the hydraulic cylinder or tool can be controlled much more precisely, enhancing control of the work being preformed. XVARI’s higher piston speeds result in a smooth oil flow compared with the pulsating oil flow of conventional technology. A closed oil reservoir prevents leakage and eliminates internal contamination from airborne particles. XVARI’S higher oil flow considerably reduces the time required to extend the cylinder or tool and build up maximum pressure. (Outflow flow rates are 0.25 l/min at rated pressure, 2.0 l/min with no load, with a usable oil capacity of 1 litre and dynamic air pressure range of 2.1-8.6 bar). The XA series is twice as fast compared to conventional air-over-hydraulic pumps. 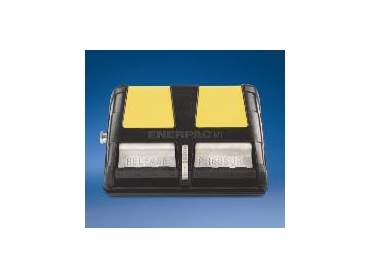 Enerpac also developed a special hydraulic release valve for the pump’s retract function. This is accurately controlled by the released pedal. The further the pedal is pressed, the faster the hydraulic pressure reduces and the faster the cylinder or tool retracts. This feature results in much better control over retract functions (for example, when a load must be lowered slowly and in a controlled manner).